The vice-presidential debate has taught us that the alternate parties are not ready. YPP, ANN and ACPN are approximately one-man shows incapable of running a government. If elected, Ezekwesili, Moghalu and Durotoye would struggle to constitute a proper cabinet… None of Ezekwesili, Durotoye or Moghalu has an able deputy; that’s a sure sign of a tumultuous government…were they to win. In a country of 91 political parties in theory but just two in practice, a vice-presidential debate was always going to be a hard sell. For many reasons. 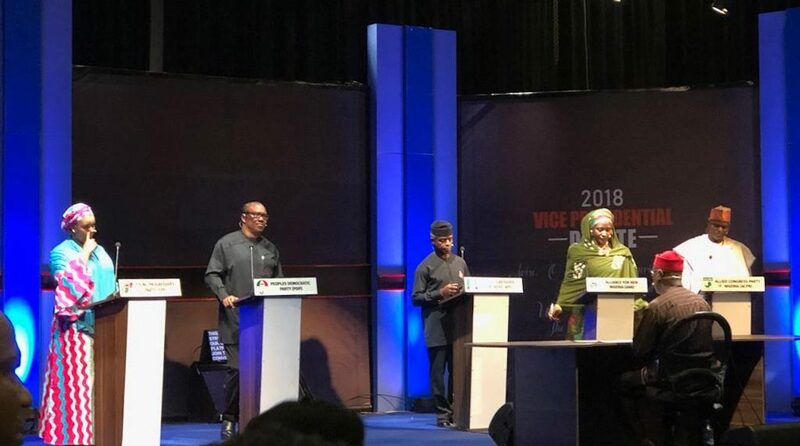 When the Nigeria Elections Debate Group (NEDG) and the Broadcasting Organisations of Nigeria (BON) announced the five parties to participate in the exercise, not many Nigerians could, off the top of their heads, name the respective vice-presidential candidates. Okay, we know the presidential candidates that are Obiageli Ezekwesili, Kingsley Moghalu and Fela Durotoye, but, for many, it still hasn’t sunk that their parties are Allied Congress Party of Nigeria (ACPN), Young Progressives Party (YPP) and Alliance for New Nigeria (ANN) in that order. Minus the press statements announcing their emergence, ANN’s Khadija Abdullahi-Iya, ACPN’s Ganiyu Galadima and YPP’s Umma Getso were unknown persons until the night of the debate. The presidential debate, scheduled for January 19, 2019, was always going to be the real deal. That hasn’t changed, of course. But with the benefit of hindsight — and ignoring the big sin of overlooking one or two other parties who should have been invited — we can thank NEDG and BON for that VP debate. It offered us deep insights into the core of the APC-PDP battle, and even deeper ones into the composition, depth and structure of the alternate parties. Obi fell short of expectations in his economy versus anti-corruption argument. His position was to justify the superiority of corruption plus economic astuteness on the one hand over the anti-corruption fight plus economic mismanagement on the other hand. Meanwhile, the expectation was that he would revisit the corruption in the Muhammadu Buhari administration: the fraudulent Nigerian National Petroleum Corporation (NNPC) deals for which Ibe Kachikwu wrote Buhari in 2017, the nepotistic secret recruitments at the Central Bank of Nigeria (CBN), the N200 million grass-cutting scandal over which the president delayed sacking the erstwhile secretary to the government of the federation (SGF) Babachir Lawal for many months, among many others. In the moment when it mattered, Obi forgot all these. It’s good news, actually, because for those who have reduced the 2019 election to a PDP-APC battle, now they know that their vote is either against one of the fight against corruption and economic mismanagement, or for one of supposed economic competence and corruptibility. Sadly, that’s nothing but a reproduction of the devil-and-the-deep-blue-sea scenario of 2015. The next logical step, then, would be to look in the direction of one of the smaller parties offering Nigerians an escape from the APC-PDP hegemony. But, on the evidence of their vice presidential candidates’ displays at the debate, ACPN, ANN and YPP owe Nigerians an apology. Their candidates — Ganiyu Galadima, Khadija Abdullahi-Iya and Umma Getso — demonstrated unpreparedness for the debate, gross lack of understanding of national issues and utter underestimation of the enormous responsibilities that come with deputising for the Nigerian president. Galadima was there for the limelight. Given a few minutes to open his remarks, he goes on and on about his gratitude for the stage, then reminds us he also featured at the 2015 debate “though as presidential candidate of the ACPN”. Abdullahi-Iya tells us she is “vying for the post of VP because I am concerned about every one of the over 2.1 million children in the IDP camps in the North-East, who are scattered all over Nigeria. I am also concerned about the 13 million children who are out of school.” Nothing wrong about caring for children but that can’t be the number one reason for seeking that office. If Abdullahi-Iya had any sniff of the Constitution, she would have known the vice president is the deputy chairman of the Council of State, the deputy chairman of the National Defence Council; and, most importantly, the chairman of the National Economic Council (NEC). Surprisingly, there was no single economy-related question that Abdullahi-Iya answered convincingly. She would be more remembered at the debate for her numerous “good evening, sir” when introducing her comments than for making any noteworthy contribution. Neither did Getso fare any better. Asked what she would do to improve the aviation sector in Nigeria, her response was: “All we need is patriotic leaders. Patriotism will save Nigeria’s aviation sector.” Asked elsewhere to explain what would be the economic thrust of her administration for the aviation sector, Getso answered: “The major thing a typical Nigerian needs to look into is to see how we can rekindle patriotism in our hearts. To be candid, what Nigeria just needs is patriotic leaders, leaders that have Nigeria at heart. This is just what I’ll say about the aviation sector.” So, if we were to vote for Kingsley Moghalu, this is the vice president he would give us? One question for Moghalu: What offence would Nigerians have committed to deserve the punishment of an Acting President Getso in your absence, if you were to come to power? It’s time alternate parties understood that the thirst for power and passion for change are not enough to succeed in the seat of governance. Beyond throwing constant jabs, however deserved, at the government of the day, these parties should spend the next four years building proper structures and propagating their ideologies within the party…. On the simple but far-reaching matter of fuel subsidy, all three alternate candidates played to the gallery: Subsidy must go. Even Obi supported this stance — same tune Buhari sang pre-2015, yet subsidy has remained in his almost four years at the helm. But no one with full grasp of the matter can advocate subsidy removal without addressing the corollary challenge of the ripple-effect spike in cost of transport, housing, food, goods and services; everything. Only Osinbajo did this. The vice-presidential debate has taught us that the alternate parties are not ready. YPP, ANN and ACPN are approximately one-man shows incapable of running a government. If elected, Ezekwesili, Moghalu and Durotoye would struggle to constitute a proper cabinet. It took Buhari six months, it probably would take them a year — unless, of course, they want to populate it with people who have little to offer beyond faith in their principal. None of Ezekwesili, Durotoye or Moghalu has an able deputy; that’s a sure sign of a tumultuous government that would eventually climax in self-implosion, were they to win. It’s time alternate parties understood that the thirst for power and passion for change are not enough to succeed in the seat of governance. Beyond throwing constant jabs, however deserved, at the government of the day, these parties should spend the next four years building proper structures and propagating their ideologies within the party in such a manner that a VP candidate can discuss the party’s ideals almost as eloquently as the presidential candidate. Until then, they are not ready.